Triggered by the increased fluctuations of renewable energy sources, the European Commission stated the need for integrated short-term energy markets (e.g., intraday), and recognized the facilitating role that local energy communities could play. In particular, microgrids and energy communities are expected to play a crucial part in guaranteeing the balance between generation and consumption on a local level. Local energy markets empower small players and provide a stepping stone towards fully transactive energy systems. 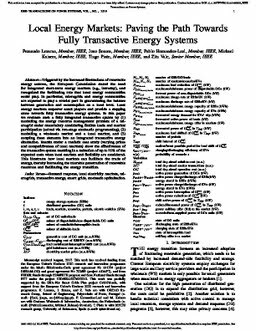 In this paper we evaluate such a fully integrated transactive system by (1) modelling the energy resource management problem of a microgrid under uncertainty considering flexible loads and market participation (solved via two-stage stochastic programming), (2) modelling a wholesale market and a local market, and (3) coupling these elements into an integrated transactive energy simulation. Results under a realistic case study (varying prices and competitiveness of local markets) show the effectiveness of the transactive system resulting in a reduction of up to 75% of the expected costs when local markets and flexibility are considered. This illustrates how local markets can facilitate the trade of energy, thereby increasing the tolerable penetration of renewable resources and facilitating the energy transition.